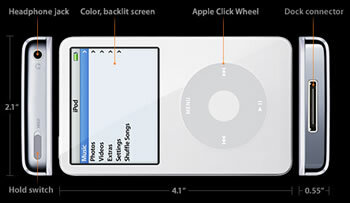 Apple's new video iPod holds up to 150 hours of video, showing it on a nifty 2.5 inch display. The iPod has a far greater capacity than H.G. Well's moving picture player, from his 1899 novel When the Sleeper Wakes. Apple's new device comes in 30 and 60 gigabyte models; they can hold as many as 15,000 songs and up to 25,000 photos. The bright 2.5 inch color display lets you take your movies (or tv shows or home movies) with you and display them at will. Read more about other exciting developments in display technology at Readius E-Reader with Rollable Display and Heliodisplay Hovers in Midair. Read more about the video iPod at Apple.